We feel blessed to be a part of this creative process, serving others doing the work we love. We play songs to welcome new born babies as well as songs to support those who are completing the circle of their lives. Someone once said, “Music is the sound of flowing life.” We feel the harp is also the sound of flowing love. 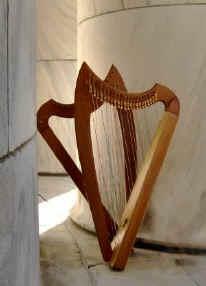 The vessel of the harp creates sacred space and anoints the vessel of the body with the sound of tranquility and peace. The harp is a physician of love. Sarah G. Schwartz B.M.Ed., C.T.H.P. Sarah is a graduate of the International Harp Therapy Program (IHTP), directed by Christina Tourin. She is also a graduate of the Sacred Art of Dying Program under the direction of Richard and the late Mary Groves, of the Sacred Art of Living Center, Bend, Oregon. Sarah graduated from Northern Illinois University with a Bachelor of Music Education degree in String Specialization and did graduate work through Bowling Green State University. She studied harp with Lee Ann Anderson at Kent State University and studied cello with Peter Howard, Ronald Leonard and Raya Garbousova. Sarah was a music educator, string specialist, for the Norwalk City Schools, Norwalk, Ohio. She currently teaches cello and beginning harp to young people who get to experience the joy of creating music. She served many years as a hospice volunteer. The people she visited became some of her most important life teachers. Sarah felt called to this ministry of playing therapeutic harp for people who are ill, to anoint them with the sound of love and the gift of peaceful presence. Sarah is interested in dream work, the psychology of Carl Jung, creating fiber art and poetry, and serving as a Eucharistic minister. Sarah’s work is her passion. She loves life! Melanie L . Brown B.S.Ed., C.T.H.P. Melanie is a graduate of the International Harp Therapy Program (IHTP), directed by Christina Tourin. She is also a graduate of the Sacred Art of Dying Program under the direction of Richard and Mary Groves, of the Sacred Art of Living Center, Bend, Oregon. Melanie graduated from The Ohio State University with a Bachelor of Science in Education degree and did graduate work at Ashland University. She studied harp with Lee Ann Anderson at Kent State University. Melanie was a teacher with the Medina City Schools, Medina, Ohio. She felt called to become a harp practitioner through the beauty of the harp and its music and the light and love shining in and through people. Her training and service as an educator, Stephen minister, hospice volunteer and Eucharistic minister have allowed her the joy and privilege of being present with people and bringing wholeness to body, mind, soul and spirit through the resonance and rhythm of the harp.